During a thunderstorm, a lot of dogs may think the world is ending, but in Jen Lee's webcomic Thunderpaw, two dogs are faced with a bona fide cataclysm. After being left in a car by their owners, they must gather all of their strength to survive the trippy horrors of the crumbling world and find their way home. Thunderpaw isn't your average Homeward Bound story. It opens with a familiar enough scene: Bruno and Ollie are stuck in a car in the midst of a thunderstorm. Ollie is freaking out—in stereotypical dog fashion, the sound of thunder makes him anxious and he's convinced that his owners are never coming back. When they're finally forced out into the wider world, it's clear that Ollie is right: something is very wrong. All of the people are gone, and something has wreaked fiery destruction on the world around them. While Ollie is on the verge of losing his puppy mind, Bruno tries to stay strong, convinced that all will be well if they can just find their way home. Bruno and Ollie possess certain canine qualities; Ollie is calmed by ripping towels, for example, and reassures himself that he's a good dog. But they also inhabit the strange, surreal world that Lee has animated around them. Most noticeably, they wear clothes and walk around on two legs. But Ollie also believes in a vengeful god called Thunderpaw, whom he fears is punishing all the bad dogs in the world. Lee makes great use of her digital canvas to convey both the emotions of her canine protagonists and the devastation around them. 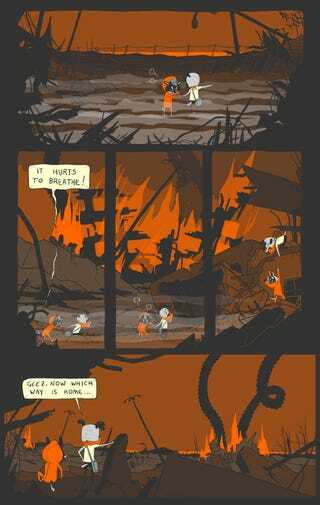 Thunderpaw is an animated webcomic, but Lee goes beyond simple animation, using the vertical and horizontal nature of the infinite canvas, and sometimes even the background to spring fresh visual surprises on her readers. It makes the journey of Bruno and Ollie that much more frightening, and leaves us to wonder if their dream of home and safety is even possible.